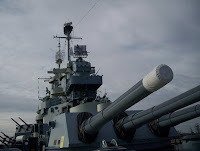 Visiting the North Carolina Battleship in Wilmington, North Carolina was a memorable experience. My daughters and husband were a little awed to be walking in the footsteps of so many brave soldiers. The men who lived and worked on this vessel are true heroes that should never be forgotten. It’s a self-guided tour so you can take as long as you want (until closing). Touring the ship can easily take 2-3 hours. The ship is metal and can be hotter inside than out. Wear your walking shoes and plan for the heat. Under age 6 is free.